This is an album of rare historical and musical value. 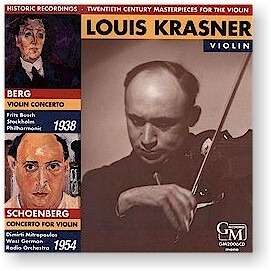 Louis Krasner was a rising young violin soloist when he commissioned Alban Berg to compose a concerto for him. The Violin Concerto was completed in 1935, very shortly before Berg’s death, and this live performance, dating from 1938, has a haunting, fragile beauty. The Concerto by Arnold Schoenberg was premiered by Krasner in 1940 and was championed by him for many years afterwards. This powerful and romantic performance was recorded in concert in 1954. Recorded on (#1-2) 20 April 1938 live by Swedish Radio and (#3-5) 16 July 1954 live by the Westdeutscher Rundfunk in Cologne, Germany.